How do I participate in a group in the Canvas Community? Participation in a group comes in many forms. You can ask a question, post a discussion, add a document, comment or reply to a content item, answer a poll, and create an event. There are several types of groups in the Canvas Community which determine access. If it's an open group, you don't need to join to participate. Membership is open and non-members can view content and participate. I Heart Pandas is an example of an open group. You can still join an open group for notification purposes. If it's a members-only group or private group, you'll have to join before you can participate. Joining a group has the added benefit of receiving notifications of all activities created and posted in the group. Membership is open and non-members can view content, but must join to participate. Most groups in the community are members-only. In a private group, membership is by approval/invitation and only members can view content and participate. To contribute to a group, you must join the group. In the Actions menu , click the Join group link . You can participate in a group by contributing to existing content (e.g., replying to a discussion, answering a question, participating in a poll, adding a comment) or creating new content (e.g., upload a document, create a new discussion or question, create a poll, write a blog post, etc.). Previous Topic:What tags should I use for Feature Ideas in the Canvas Community? Next Topic:What can I do as a group member in the Canvas Community? 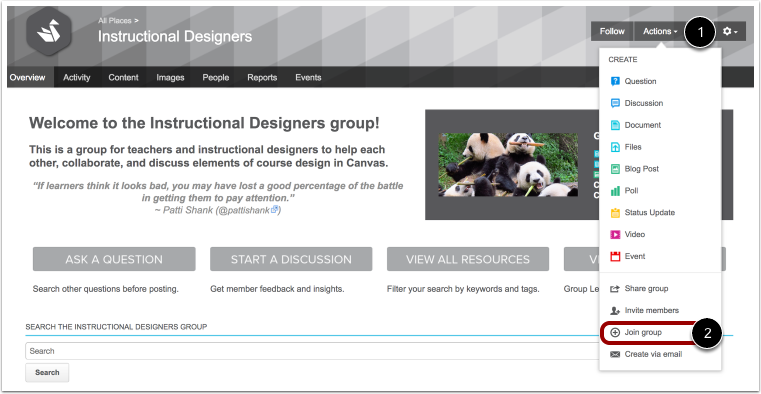 Table of Contents > Groups > How do I participate in a group in the Canvas Community? After the instructor guides, what is the next best source of information?